(27 September 2018, Paris)–World-renowned property summit MIPIM Asia 2018 will offer a glimpse into the cities of the future, with this year’s event carrying the future-facing theme “Invest in a better tomorrow”. More than 900 property leaders from across the continent will gather to wonder how coming generations will live and work, at the leading industry event, taking place in Hong Kong on 27-28 November. Inviting contributors to imagine the world in 2030, the conference agenda will present real estate professionals with valuable insights into hot topics including smart cities, sustainability and the blooming proptech boom – as well as exploring retail trends and the ever-growing investment opportunities presented across the world’s most populous continent. Playing the joint roles of property expo, industry conference and networking summit, MIPIM Asia is a regional spin-off of the annual MIPIM summit, hosted in Cannes every March and established as the world’s leading property market. Following upcoming sister events including MIPIM UK (17-18 October) and MIPIM PropTech NYC (6 November), MIPIM Asia is organiser Reed MIDEM’s last major global property show of the year. “I’m thrilled to cap an incredible and innovative year with our trademark event celebrating the world’s most dynamic continent – MIPIM Asia,” said MIPIM director Ronan Vaspart. “Cities across Asia are consistently ranked among the fastest growing in the world, and Asia is expected to hold its status as the fastest developing continent until at least 2030 – the year we’re asking professionals to imagine at MIPIM Asia in November. A packed programme of more than 30 conference sessions over two days, featuring headline keynote speakers, pertinent panel discussions, networking events and more. A special focus on how technology is transforming traditional property issues, at the all-new MIPIM Proptech Asia series – an intensive standalone programme of eight sessions across two stages. A keynote speech on smart cities from celebrated China expert Jonathan Woetzel, MGI Director and Senior Partner at McKinsey & Company’s Shanghai office and co-author of numerous influential books on regional business, including The One Hour China Book and Operation China: From Strategy to Execution. Detailed analysis of retail property trends on high streets across Asia-Pacific, including a fresh focus on the roles played by the F&B, culture and leisure sectors, as part of the annual Retail Forum Powered by MAPIC. The Belt & Road Forum – a daylong series of sessions examining the collaborative prospects presented by China’s Belt and Road Initiative (BRI) in the UK, France, Russia and beyond. Networking opportunities with 900+ delegates representing 750 companies, including more than 120 C-level representatives booked to appear as guest speakers. A forward-facing agenda exploring the future opportunities of employment and lifestyle trends including co-working and flexible workspaces. 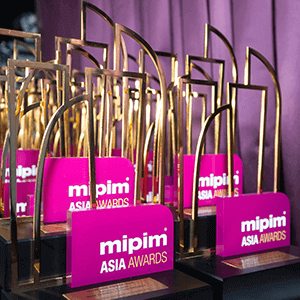 Regional winners of the prestigious MIPIM Startup Competition – which celebrates the most promising and innovative property start-ups – will be revealed at MIPIM Asia on November 27. The contest is open to entries until the deadline of October 28, before the shortlisted finalists are revealed on November 14.